Hey people! A while ago, i made a Trebuchet with a whole lot of information to back it up scientifically speaking, sadly, I lost said Info, but I still have the Awesomeness, I will try and explain each image. The ideal counterweight-projectile weight ratio is 133:1 that is, if you have a marble weighing 1 gram, your ideal counterweight should weigh 133 grams. I know there is a definite formula to take full advantage of the sling, but I never did look into that, I just made it by trial and error. This is what I used as a counterweight, it is a part of a veeery old air pressure release valve. It weight about 600 grams give or take 50.
this piece is to demonstrate that it could be cocked by human power. The method is somehow like this starting from an un-cocked position like in the first image: pull the long arm wit a rope about half way, place the end of the sling with the little ring in the bent wire at the top of the arm, connect the two triggers wind it up, load projectile, shoot. close up of the sling trigger. The size of the supporting things at the side don't matter (just make it tall enough so that the counterweight has enough room to swing), the only measurement you need is the size of the long arm with the correct ratio, in my tests ratio 3:1 proved to be the best. The wheels may seem like a cosmetic feature, but the actually help the trebuchet throw the projectile farther, so if your building one, try adding wheels. I will gladly answer any questions you have. Looks nice! It looks like it could use some more finishing up, For instance, when you look at the wheels, and how they are secured. It's just folded over. It does the trick, but if you want to make it even better looking, I'd go for that. Maybe you could paint the wood, as well? Too bad you can't do a video though, I would have loved to see that thing in action. But nice build anyway! But, the wheels were made like that purposely, its the simplest way I could come up with at the time, and still give it the realistic look, you know? what I would change is the long arm, make it round, for instance. The string look very cheap too, but they hold, and the winding mechanism, the whole thing is very weak, so change all that. Oh that's cool. 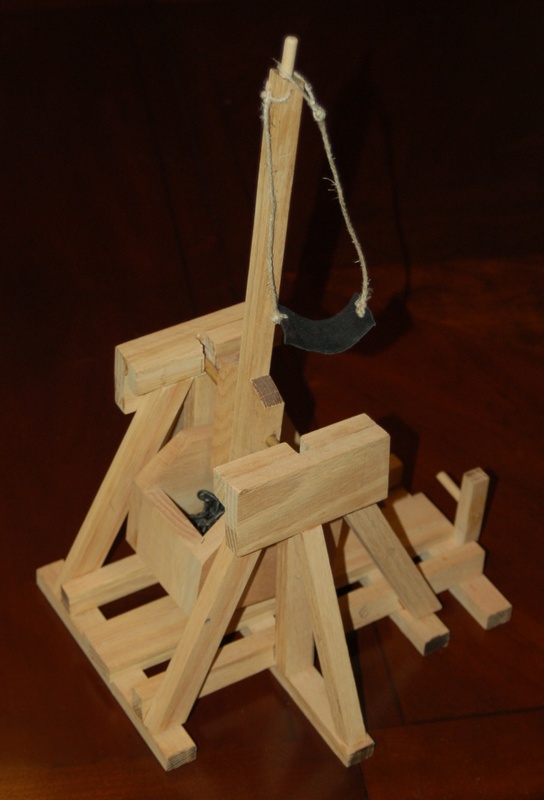 I just got into wanting to build a ballista, though I don't have any hardwood. I'm actually building one, and I am using hardwood (mezquite) but it feels as though you don't need hardwood, really, try building it with softwood, just make sure the gap between the torsions is relatively short. I made one of those... 1.5ft tall out of red oak with chain as a counterweight.